You answer me! Stay where you are and identify yourself. Bernardo’s exclamation is the password that identifies him to Francisco as a guardsman, rather than a potential enemy. It’s also the second half of a traditional saying that is used when a new ruler succeeds a deceased king: “The king is dead. Long live the king!” The phrase emphasizes the continuity of the monarchy, which will live long despite the death of a king. You’re right on time to take over the watch. The clock tower has already struck midnight. Get to bed. Thanks for relieving me. It’s bitter cold and my nerves are shot. Have you had a quiet watch? Well, good night. If you meet Horatio and Marcellus, who are going to stand watch with me, tell them to hurry up. I think I hear them coming. Stop! Who's there? And soldiers of the king. I think I hear them. Stand! Who's there? Good evening. Who has relieved you? Bernardo has taken my place. Good night. Hello, Marcellus. Is Horatio with you? Horatio is huddled up because of the cold. Horatio is not wholeheartedly into this late-night search for a ghost. Horatio thinks we’re just imagining all this. He doesn’t believe that we’ve actually seen this strange thing twice now. So I’ve invited him to stand watch with us. If that figure appears again he’ll see it with his own eyes, and he can try to speak to it. Nah, it’s not going to appear. Bernardo and Marcellus “assailing” Horatio’s “fortified” ears with their story metaphorically compares their account to a medieval army assaulting a castle or fortress. Have a seat, and let us give you the whole story, which you find so hard to believe. Okay, let’s sit down and I’ll listen to Bernardo’s tale. Quiet! Look, there it comes! It looks exactly as last time, just like the dead king. You’re educated, Horatio; speak to it. Doesn’t it look just like the king? Watch it, Horatio. This is frightening and incredible. [To the ghost] What are you? What right do you have to come at this time of night and to assume the majestic appearance of our dead king? In the name of God, I demand that you tell us what you are. Most like, it harrows me with fear and wonder. Shakespeare has set a tense atmosphere. How now, Horatio! You tremble and look pale. Stay! Speak, speak! I order you, speak! It’s gone; it’s not going to answer you. What’s wrong, Horatio? You’re trembling and as pale as a sheet. Isn’t this more than our imagination? What do you think? I swear to God, I wouldn’t have believed it if I hadn’t seen it with my own eyes. Around 1250, a group of knights—including some Danish royalty—embarked on a crusade. Their objective was not to retake Palestine from the Muslim Ottoman Empire, but to attack the Eastern Orthodox Christians of Northern Europe, whom they considered to be pagans. The two forces clashed in a battle on a frozen lake near the Baltic Sea. If, as some critics think, Shakespeare is alluding to this battle, what does this knowledge add to the scene? Isn’t it just like the king? This ghost looks as much like King Hamlet as you look like yourself. The armor it’s wearing looks exactly like the armor King Hamlet wore when he fought the king of Norway. And it frowned just like King Hamlet did when he fought the Poles in that battle on the frozen lake [see note]. This is really weird. That’s two times already we’ve seen this thing in the middle of the night march past us with that military stride. I have no idea what to make of this, but my gut feeling is that this means something bad is going to happen here in Denmark. With martial stalk, hath he gone by our watch. Sit down, and whoever knows what’s going on, please explain it to me. Why are we having to stand all these guard watches? Why are the forges casting more and more cannons every day? Why are we buying weapons abroad? And why are all the shipbuilders working in the dockyards day and night, even Sundays? Who can explain all this? Doth make the night joint-laborer with the day? I can – at least as the rumors have it. 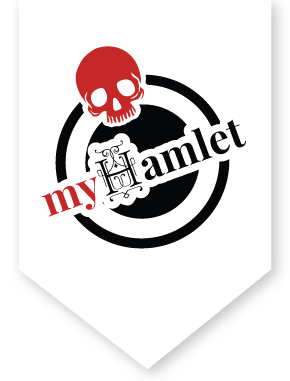 Our recently deceased King Hamlet, whose ghost it seems we’ve just seen, was challenged to a one-on-one fight by King Fortinbras of Norway, acting out of ego and envy. King Fortinbras, having legally wagered all his family’s lands on the fight, ended up losing not only his life but his family's royal estates as well. Our King Hamlet had wagered an equivalent amount of land which would have gone to Fortinbras had he won, in accordance with that same agreement under which Fortinbras forfeited his lands to our king. But now the slain king’s son, Prince Fortinbras, though untested as a ruler and warrior, has raised an army throughout Norway with the intention of invading Denmark and taking back the lands his father lost. As I understand it, that’s the reason behind the war preparations, why we have to stand these watches, and the cause of this commotion throughout Denmark. Of this post-haste and rummage in the land. The political situation in Denmark. But soft, behold! Lo where it comes again! Horatio intends to cross in front of the ghost to confront it. He wants to make the sign of the cross for protection—in case it’s an evil spirit. Quiet! Look, there it comes again! I’ll confront it even if it attacks me. [To the ghost] If you can talk, speak to me. If there is anything which I can do to help you which would also reflect well on me, speak. If you’re aware of some danger which, if we know about, we could avoid, tell us. If you have come back to guard stolen treasure which you buried during your lifetime – one reason, they say, you sprits roam the earth – speak. Tell us why you’re come, stay here and tell us. Don’t let it go, Marcellus. Speak of it. Stay and speak! Stop it, Marcellus. Should I hit it with my lance? Hit it, if it won’t stay. We shouldn’t be trying to harm it; it looks like royalty. Besides, it’s pointless to strike at it; our weapons just pass through it like air. It was about to speak when the rooster crowed. It panicked like a criminal spotted by the police. I’ve heard it said that when the rooster crows in the morning, right before daybreak, all spirits rush back to wherever they come from – whether that’s in the sea, air, earth, or fire. This ghost’s behavior seems to prove that’s true. It certainly took off when that rooster crowed. Some people say that at Christmas time, roosters crow all night long, which keeps evil spirits from coming out. This makes the nights completely safe during that holy time of the year – misaligned planets can’t do any harm, bad fairies can’t take anyone’s life, and witches have no power. And then, they say, no spirit dares walk abroad. I’ve heard that also, but I don’t completely believe it. Look over there where the sun is rising; those hills seem to be wearing a red cloak. Our watch is over now, and in my opinion, we owe it out of duty and friendship to tell Prince Hamlet what we’ve seen tonight. That ghost wouldn’t speak to us, but I’ll bet my life it’ll speak to him. Let’s do that, and I know exactly where we can find Hamlet this morning.